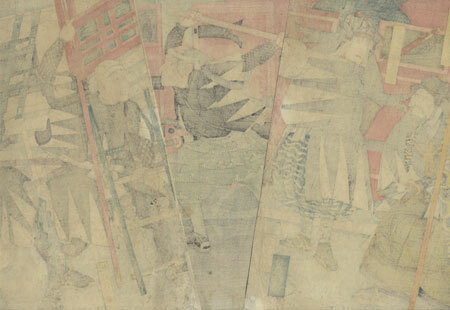 Comments - This unusual triptych depicts a display of life-size "dolls" in a scene of the night attack on Moronao's mansion from the classic tale of the 47 ronin, the "Kanadehon Chushingura." In the center, one of the ronin swings a giant wooden mallet as he attacks the wooden front doors. The two samurai at right carry bamboo ladders with hooks on the end to help scale the outer walls. 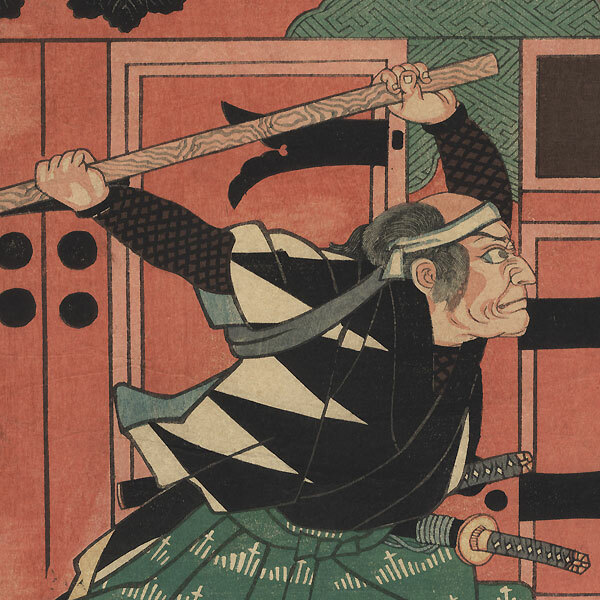 The young Oboshi Rikya, son of the ronin's leader Oboshi Yuranosuke, stands at left, looking cautiously over his shoulder, while an elderly warrior in front of him grips a naginata, his hand on the hilt of his sword. Each man wears the ronin's trademark black and white dogtooth bordered robe over his armor. In 1855 - 1856, Kuniyoshi did a series titled "Modern Select Dolls" based on a group of "dolls" on display at Kannon Temple in Asakusa. The dolls were actually very realistic, life-sized figures (iki-ningyo) dressed in real clothes, set into scenes from history and legend. This print was likely done at the same time. An interesting and unusual Kuniyoshi design. Image Size - 14 1/4" x 29 1/2"
Condition - This print with excellent color and detail as shown. Three separate panels. A couple small holes repaired. Some light toning at edges. Please see photos for details. Nice overall.